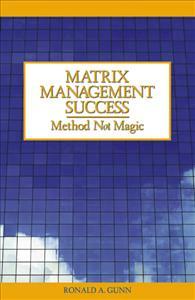 Tools for matrix management success: This book offers insight into matrix management design and implementation and provides real-life examples to demonstrate how to avoid common pitfalls that impede success. This book answers the question for the matrix organization. Matrix management is more than “dotted-line” relationships or “sharing staff.” It’s about the roles, rules, and tools required for success. This book spells out the design of the matrix organization; and discusses implementation strategies; and reviews the common pitfalls and ways to overcome them. Real-life examples on the use of matrix management in business and government sectors are detailed. Business sector examples include manufacturing, research and development and information-technology.